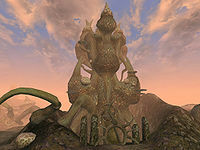 Tel Naga is the mushroom wizard tower of Master Neloth in Sadrith Mora. Neloth is guarded by personal retainers, complete with Bosmer archers, and resides in the Upper Tower. He is a Master in House Telvanni. Neloth sports a collection of rare treasures, and apparently a common Telvanni pastime is to steal treasures from each other. Fast Eddie will ask you to steal a Key to Tel Naga to retrieve the Ring of Equity. The young daughter of the Redoran Councilor Miner Arobar, Nartise, is held on the lower levels of the tower and is well guarded. Ring of Equity: Help Eddie to retrieve this magical ring from Neloth's treasury. Flesh Made Whole: Retrieve this amulet from Tel Naga in Sadrith Mora.